There is no fun without solid safety codes and regulations. Feeling safe is important to relaxing and enjoying our sailing on the water. Your skipper will advise you of the presence and location of basic amenities and safety equipment. Ask and you will learn of Coast Guard regulations, rights of way and other interesting "rules of the road". Our Skippers are well-versed in everything safe, you, and then the boat. 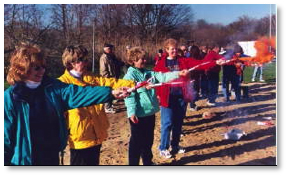 And every spring there's a safety class offered to members on the use of flares, fire extinguishers, and other safety equipment.